Join The Literary Hour and Long John Silver as they host a riotous knees up using techniques as old as fire to carefully curates courses with thoroughly modern twists to ensure you survive the perilous crossing. It wouldn't be a sailor's life without tinned, salted, dried and smoked goods, but don't worry you won't be catching scurvy, as we're spicing up these age old preserving techniques to ensure a sumptuously safe passage is made to the treasure. If you're a discerning diner in search of a sumptuous yet adventurous dinner then sampling Long John Silver (or Barbecue as he's known affectionately to his amigos) tastiest dishes and finest grog will be exactly your flavour. Amongst other delights, you'll devour the finest sustainably sourced smoked kid (please note no children were hurt in the preparation of this menu, but if Long John Silver had had his way Jim Hawkins future may not have been quite so illustrious). 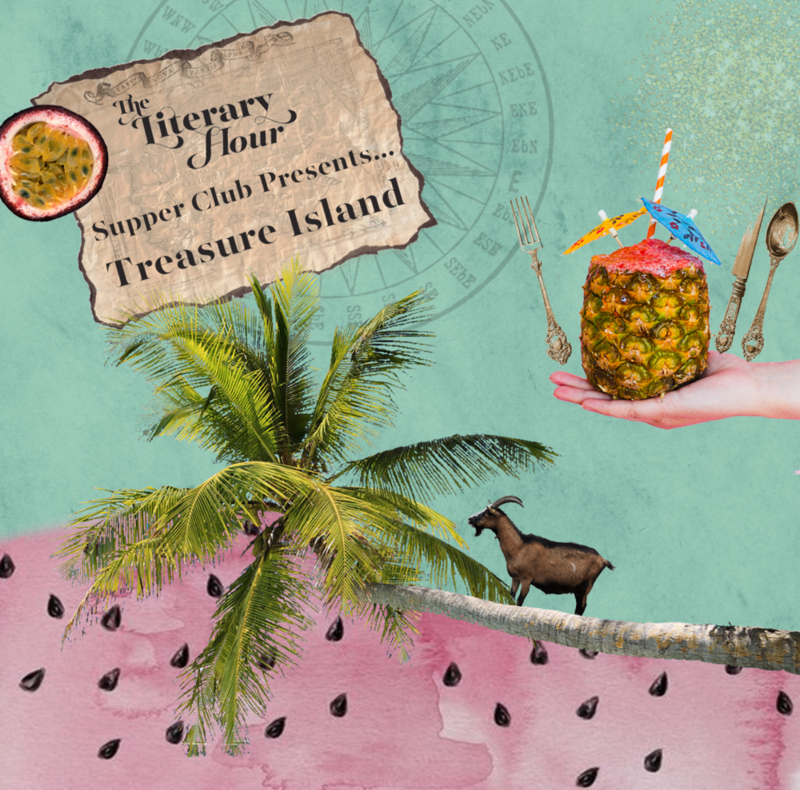 After sell-out successes that have delighted diners with A Feast in Narnia, disgusted them with Dr. Lecter's brain fritters, and whisked them Around The World In 80 Days, The Literary Hour are back. This chapter will be inspired by Robert Louis Stevenson's buried treasure escapades. There will be the usual top secret Literary Hour culinary surprises peppered throughout the evening as well as readings to accompany and contextualise each course. To give you a flavour of the fun that awaits without giving away all the secrets, previous surprises have included a Turkish Delight guess the flavour game (The Lion, The Witch and The Wardrobe), snuff (Cider With Rosie) and Willy Wonka's 3-course dinner chewing gum (Charlie and The Chocolate Factory). Tickets are £49 + Booking Fee for a welcome cocktail, 4 courses and some Literary Hour surprises and culinary treats smuggled in along the way. There's also the choice of a drinks flighting, (a glass of prosecco, a cocktail and two glasses of wines) perfectly paired to compliment the mouth-watering creations. Please note this supper club is for adults 18+ only. We can only cater for pescetarian and vegetarian dietary requirements at this pop-up. There's a reasonably priced bar selling paradisaical cocktails, wine, beer and soft drinks. Doors will open at 18:30 (17:30 on Sundays) and you'll be greeted with a welcome cocktail and canapés and then guests will sit down from 19:00 (18.00 on Sundays). As this is a supper club all guests will feast upon the same menu (with the exception of veggie and pesci alternatives for some courses) and the vibe of the evening is very relaxed; we will be creating an environment and ambiance that lets you relax and enjoy the evening with old friends and hopefully make new friends too. We won't be rushing you or asking you for your table back so please come prepared to make good time and convivial memories and expect the evening to end at approximately 22:30 (21:30 on Sundays).